Vocabulary is an important part of every subject. There’s always words that students need to learn to better understand the concepts being taught. Unfortunately, many students struggle to remember what the vocabulary words mean. To help students learn the definitions, try these 9 classroom vocabulary games with your students. Break the class into 2 groups. Assign each group half of the vocabulary words. Have students use a dictionary, thesaurus, or the Internet to discover synonyms for each vocabulary word. Then, have the groups take turns reading the list of synonyms to the other group. See if the groups can figure out what the word is based on its synonyms. Have students pair up and . Then, they should write a vocabulary word in each square. As students play the game, they need to provide the correct definition of the word in the square. They could also make up a sentence using the word. If the student can do it, they get to claim that square. Create a for each student. Have them write a vocabulary word in each space. Then, read the definition of each word. Students should be able to determine what word you defined and put a counter on that square. Have students say “Bingo” when they get 5 words in a row. As an extra incentive, provide a prize for winners. It could be a free homework pass, candy, or small toy. Split the class into 2 teams. Have one student from each team come to the board. Assign them one vocabulary word to draw. The students’ teams should try to guess what vocabulary word is being drawn. Charades is set up similarly to Pictionary. However, instead of drawing, students act out the vocabulary word. If you have timid students, consider assigning 2 people to act out the words at a time. Half the class should in the room. Then, the rest of the class should form a circle around them. Give each student a vocabulary card. Have both circles face each other. Then, the students in the center can test the students in the outside circle and vice versa. Have the students in the outside circle rotate one person to their left each time until everyone has seen each word. Divide the class into 2 or 4 teams. Have each team take turns answering a vocabulary question. If they can answer correctly, the team gets 1 point. Then, give that team a ball. (It could be made from recycled paper.) If the team can make a basket into the trashcan, reward the team an extra point. Provide groups of students with newspapers or magazines. Have them look for pictures or articles that relate to each vocabulary word. Give students a set amount of time to complete the assignment. Then, have students present their findings to the class. Write each vocabulary word on the board. Then, divide the class into 2 teams. Have one student from each team come to the board holding a flyswatter. Read the definition of a vocabulary word. Students should race to see who can locate the correct word on the board the fastest. When they find it, they should hit the word on the board with the flyswatter. Play until everyone in the class has had at least one turn. 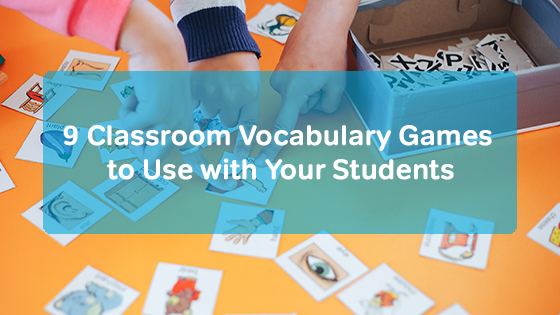 Classroom vocabulary games are some of the many fun teaching games out there and a great way to motivate students to study the words. It also helps them review the definitions. Most of these games don’t require a lot of preparation to play, so you can play them whenever you have extra time that you need to fill or just need a fun activity.